The lands that make up Georgia's beautiful National Forests were once the lands nobody wanted. The early history of Georgia is a tale of abuse and overuse of the fragile ecosystems. Hydraulic mining for gold, cut and leave practices of early timber companies, wildfires, over-grazing and unregulated hunting and fishing led to a forest that was in need of extensive restoration efforts. The Forest Service purchased 31,000 acres in Habersham and three other North Georgia counties in 1911 for $7 per acre. In the beginning, the Chattahoochee was part of the Nantahala and Cherokee National Forests in North Carolina and Tennessee. Many of the early purchases were old homesteads and abandoned farm lands. On July 9, 1936, the Chattahoochee National Forest was proclaimed as a separate National Forest. At that time, Forest Service managers began to restore these lands by planting trees, fighting wildfires, controlling erosion and introducing wildlife and fish back into their natural habitat. As a result of a concentrated effort by the Forest Service and the Department of Natural Resources personnel, the deer and trout populations which had been virtually eliminated, were brought back to today's healthy and productive level. Today's estimate of the deer population is more than 30,000 animals and a turkey population of over 6,000 birds. Likewise in 1970, the bear population on the Chattahoochee totalled 106 bears. After 20 years of continually managing the habitat for this animal, the Chattahoochee today boasts a healthy bear population of more than 650 animals. Today, the National Forests provide an abundance of recreation areas and activities including picnicking, boating, swimming, ORV/ASTV rides, hiking, camping, fishing, viewing waterfalls, horseback riding and mountain biking. Most of these activities are available right here in Habersham County. There's plenty to keep the whole family busy between the water sports, hiking trails, campground and picnic sites. The 42 campsites overlook the lake and can even accommodate five 40-foot RV's as well as tent campers. While there are no electrical hookups at the campsites, there are hot showers conveniently located throughout the campground. Also available to RV users is a dump station convenient to campsites. At Lake Russell you'll find hiking trails that range from moderate to difficult, boat ramp (electric motors only), and a group picnic shelter. The picnic shelter at the beach may be reserved, otherwise it is first come-first served. The 6.2 mile Oakey Mountain trail is suitable for trail bikes, three-wheelers and ATVs with less than 48-inch axle width. This trail is near both Lake Burton and Lake Rabun. It is not a loop trail so traffic is two-way. Some sections are steep (35 percent grade) and rocky. There are also many blind curves on the trail. Under-age riders who do not have a state driver's license should be accompanied by a legally-licensed driver. 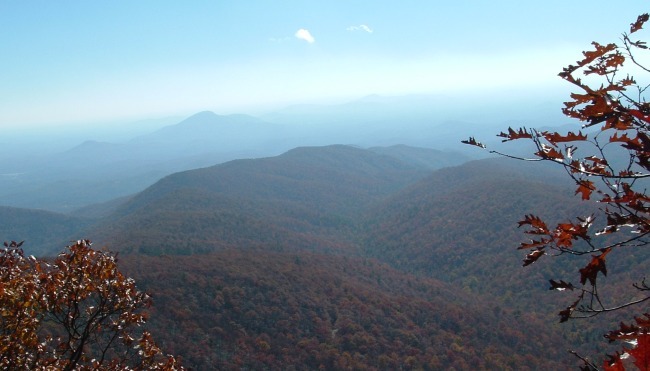 The 3.5 mile Moates Knob ATV Trail is suitable for three- and four-wheel ATVs and motorcycles. This trail is a spur trail off the Oakey Mountain ORV trail. These trails are in the Tallulah Ranger District in Clayton. For more information call 706-382-3320, weekdays from 8 a.m. until 4:30 p.m. Located in the Chattooga Ranger District, this cool wooded site on Panther Creek has two picnic shelters. Picnicking, hiking and fishing are available. Panther Creek Falls Trail (5.5 miles) follows Panther Creek through stands of hemlock and white pine along steep, rocky bluffs of the creek. The trails passes a series of cascades, as well as Panther Creek Falls. It terminates where Davidson Creek joins Panther Creek. The trail is noted for its beautiful variety of wildflowers and ferns. The stream offers excellent opportunities for trout fishermen. For more information about these sites, please call 706-754-6221 or write U. S. Forest Service, Chattooga Ranger District, Hwy 197 North, Clarkesville, GA 30523.